Building customer loyalty | Shared Alliance Insurance, Inc.
As a business owner, you want a way to ensure customer loyalty and reward your best customers. Any way you can increase customer loyalty will help you build a strong customer base and help you build and grow your company. 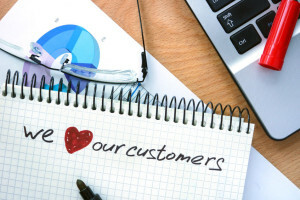 So, how do you get started building a customer loyalty strategy? Here are a few ideas to help you get started. Everyone loves a good deal and sending out coupons is a great way to attract new customers and encourage existing customers to keep using your products/services. There are several ways to send out coupons to customers including sending out links via email message, via SMS messages or through social media. You can even choose to send coupons out only to “select” preferred customers. These customers will appreciate the fact that you value their business and want to give them access to special discounts. If you are thinking of starting a customer loyalty program to entice your best customers to stay with you, you want a program that is as unique as possible. There are many loyalty programs out there and you want to stand out from the crowd. Customer loyalty points can be accumulated to use for free services/merchandise. Another strategy that many customers will appreciate is the ability to turn their loyalty points into a donation to their favorite charity. You can award loyalty points for any number of actions including referring new customers, winning contests or coming up with innovative ideas for improvement. Use your imagination and come up with unique ideas for building customer loyalty points. The best business strategy to attract and keep customers is to keep customers satisfied. One way to do this is to invite feedback. How can we improve? How can we serve you better? Customers like to have a voice and know they are heard and appreciated. If you invite feedback, take the time to respond and let customers know you have heard their ideas and will take each idea into consideration.